Debut releases often present themselves as a daunting prospect for the average band; members often haven’t quite had the time to build chemistry between them and they are often inclined to dabble in a few different styles before settling on a channeled sonic identity. Apex’s debut effort ‘Limitless’ most certainly doesn’t fit this agenda. 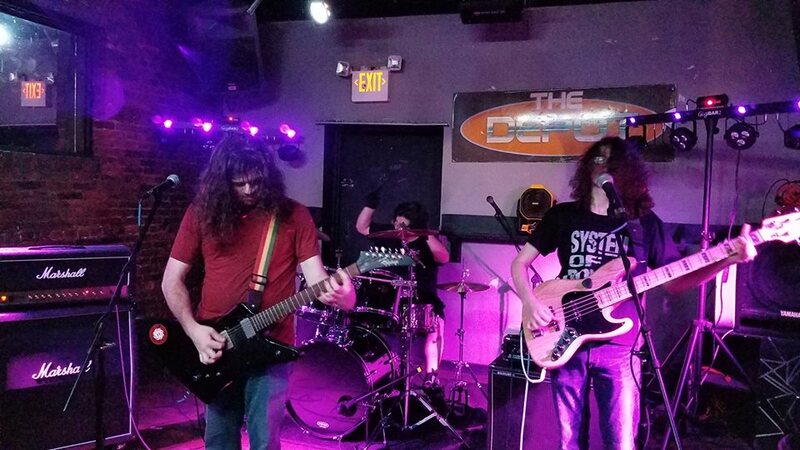 Based in Maryland, the three members initially met through mutual attendance at the after-school programme ‘School of Rock’ and bonded over a love of all things progressive rock. After testing the waters with a couple of pre-release tracks online, the band decided to take the plunge by releasing a 5 song debut, primarily recorded at Harbour Red Studios in Baltimore. The resulting product, ‘Limitless’, serves as an effective portrayal of three very talented musicians who are overtly confident in their sound, chemistry and message. The EP confidently kicks things off with the title track. Their progressive rock influences bare their teeth directly out of the gate, with ambigious chromatic guitar stabs followed by a range of well-crafted riffs strongly alluding to the work of Dream Theater and King Crimson. An instant standout on this track comes in the form of drummer Nick Cordone; his double bass work in particular is excellent, making appropriate use of both pedals to accent transitions as well as points of melodic and rhythmic interest without over-using them as many drummers tend to. His tom and snare fills truly liven up the arrangement and provide solid infrastructure to guide the band through an array of complicated rhythmic sections. Despite the heavy flavour to this track, I noticed that guitarist/vocalist Tommy Noone had clearly prioritised the melody on his vocal track. the wordy, phrygian verses are contrasted with a more diatonic chorus, effectively providing several catchy melodic fragments that are sure to remain stuck in the listener’s head under the complex nature of the riff work. There’s also some great use backing vocals in the chorus, which continue to form a contrast to the busy nature of the instrumentation. This is something I’d hope the band look to prioritise in a live setting as it adds a real presence to the vocal track. ‘Crushing Reality’ sees a set of chugs in 3/4 giving way to a string-bending main riff. Bassist Beckett Milzan takes the limelight on this track, making use of a wah-wah pedal to spruce up his bass part. This is something I don’t think I’ve ever heard before and it most certainly would be a lot of fun to see in a live setting. At this point, it becomes clear that the band adhere to the power trio format very effectively; both Noone and Milzman make use of a range of effects pedals to add variety to their sound whilst Cordone makes frequent use of his toms to help fill out the midrange. One thing I do notice is that much of the lead-work on the EP is dubbed over rhythm guitar. Whilst this works fantastically well in recorded format, the band may have to take this aspect of their sound into consideration when performing live. I’d recommend either making use of a loop pedal for the rhythm tracks or possibly employing distorted bass when Noone switches from rhythm to lead to prevent the momentum from dropping out. The nine minute epic ‘Cataclysm’ opens with distorted slap bass and a busy tom beat, going on to showcase a range of technical abilities from all members. One thing that’s notable by this stage is the band’s ability to fully-develop their musical ideas. Each track features a variety of riffs that are well-developed and melodically sound, with much of the material placing a strong emphasis on rhythmic variation. This shows a very high level of musicianship from each member and works especially well within the progressive rock and metal genres. My attention also turns to the EP’s production, which is outstanding. Engineered and mixed by Baltimore-based Kenny Kingsborough, all instruments are very well recorded and it’s clear both the band and Kingsborough have taken adequate time to source appropriate tones and obtain the best takes possible. Mixing-wise, the majority of the production is dry and compressed, which works especially well to support the material’s relentless momentum and keep things sounding as heavy as possible. Much of the lead work is much wetter, effectively allowing attention to be drawn to itself in contrast with the more hard-hitting backing track. The mastering is also excellent, with no sudden changes in volume or production style from track to track, making the EP feel like a complete body of work. ‘FAA’ Opens with clean phase guitar before the full band joins in on the descending main riff. By this point I was able to validate my suspicions of what I believe to be the band’s biggest selling point; they have an incredibly good understanding of their sonic identity and incredible chemistry as a musical act. The members feed off one another very well and have obtained a very channelled sound, something rarely-seen on first releases. With this affirmed, I was eager to research their social media presence to assess how their visual identity matched up. Whilst the band are most certainly on the right path, proudly showcasing the band t-shirt and long hair look, I struggled to find a professional full band shot, biography or even an item of artwork that effectively communicated the fantastic identity laid out through their sound. If the band were looking to market themselves within the music industry, I would strongly recommend they provide some thought to how their visual identity would pair up to their sonic identity through appropriate photography, artwork and a suitable biography. The EP closes with a demo recorded at Omega Studios entitled ‘Under The Sun’. This is much rawer in production and provides a nice taste of what’s to come from the band on their next release. I also thought the demo provided a real human element to the band when contrasted with the more polished production of the main EP, letting us know the band maintain their high standards all the way from pre-production to the finished product. Overall, ‘Limitess’ is an appropriately-titled debut for a band who a more than capable of surpassing all boundaries. Their musicianship, chemistry, attention to detail and innovation is outstanding and they have an incredibly channeled sonic identity. Over their coming few releases, I’m looking forward to seeing them develop their sound further and appropriately match their visual identity with their sonic identity to best market and promote themselves as a thoroughly cohesive unit. Highly recommended for any fans of progressive rock or metal.